What up Krooks and Vandals.. we have great news from the Krooks front line. 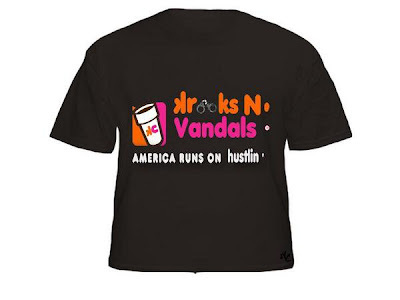 Our America Runs On Hustlin' & Life Style of the Rich and Krooked tees are movin' like uncut product! Lifestyle Tees are all sold out and there are limited America Runs On Hustlin' Tees left. Next week we will re up and will have 3 new designs for the end of the year. Great way to finish off 2010! Until these America Runs On Hustlin' Tess are gone they are on sale for $20. You can use the paypal button bellow to pay threw credit card or paypal or you can hit up krooksclothing@gmail.com to place orders. You can always hit the - Krooks Clothing Facebook Page - for orders and to stay up on the latest news from Krooks Worldwide. Stay up and stay KROOKED!